We believe in the Great Commission! None of us can do it all, but each of us must do our part, whether it be to go out into the world and preach the gospel to the masses, to share with your neighbor, to teach in your church, or to financially support those who do go out and preach. Christ has called us to focus the majority of our evangelistic efforts on the great continent of Africa. We have held many missions in the nations of Kenya, Uganda, Tanzania, Zambia, and Nigeria, and have seen countless numbers of Africans come forward to announce they wanted to give their lives to Jesus Christ. Located throughout our website (spiritofgrace.org) you will find inspiring videos, testimonies, and pictures of previous missions. God’s calling on Dennis’ life not only involves evangelism, but also the feeding of believers through teaching and writing. Dennis has taught and written in a variety of formats, but the one form that seems to be blessed above all else is the writing and recording of relatively short devotional / teaching articles. Dennis normally writes a new article each week. After the article has been written, he then records it in audio format. These teaching may be found in huge numbers on our website. To view a catalog of all Dennis' many articles, click here. The teachings are sent out monthly on CD to our “Friends of Grace” (those who support our ministry with regular gifts of $25 or more – or those who make annual gifts of $300 or more). These teachings have been used in Bible studies, copied and posted on Facebook, used in prisons, and in various other ways. These CDs and the devo articles which correspond to them cover nearly every imaginable Bible topic, and also include a number of biographical and historical sketches. We have a heart to help and equip pastors and those who feel a strong calling to serve in various forms of ministry. We especially feel called to help African pastors, many of whom have very few resources, and have had little or no training or schooling in ministry. 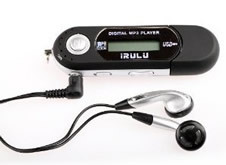 Nearly every time we do an African mission we give away mp3 players loaded with teachings from some of the finest American Bible teachers. We also will usually give away a laptop, and several cameras. At times we have provided bicycles for pastors who had no means of transportation. Many of these pastors have had to walk many miles to get to church on Sundays. It is a thrill for us just to watch how excited they are about receiving a shiny new bicycle. In the future we desire to do even more than we have done until now. We are just launching an Internet Bible School so that African pastors (and others) can receive solid Bible training, even when they cannot afford to go to a regular Bible College. 1) The easiest way is to make sure you are on our mailing list and are receiving our monthly newsletter. This will include one of Dennis’ latest articles in pamphlet form, and a short news sheet which gives some of the latest info on what our ministry is doing, has been doing, or will be doing. This newsletter is free and without any obligation. Just write or email us and give us your physical address. 2) Another way to stay in touch with our ministry is to make sure you are on our e-newsletter list. The e-newsletter comes out weekly and contains many more teachings than the physical newsletter. It also contains links which will take you to videos we produce, and many free downloads that are available. 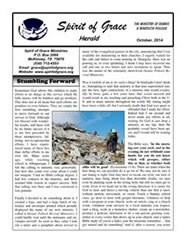 To get on this e-newsletter list, please send a request by email to: grace@spiritograce.org. 3) To help you to become more acquainted with our teaching ministry, we would be glad to send you our Audio Devo teachings on CD monthly for one year, for the introductory subscription price of $20. 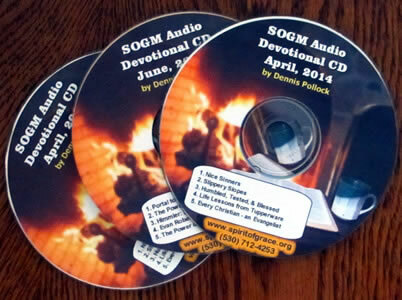 You will receive one CD each month, which will normally contain 5 different audio devotional teachings / bios by Dennis. To get your one-year subscription for our Audio Devos (1 CD each month) click here. 4) As you become acquainted with our ministry we hope that you will consider supporting our ministry by becoming a “Friend of Grace.” This involves making a commitment to support our ministry with a monthly gift of $25 or more, or an annual gift of $300 or more. You will automatically receive our Audio Devo CD each month, plus you will receive DVD video reports of each mission that we do. To become a Friend of Grace partner with this ministry, just click on any of the yellow "donate" buttons on this website, make your first donation, click on the line which says, "Add special instructions to the seller" and write the words "for Friends of Grace" in the box. We need your help! 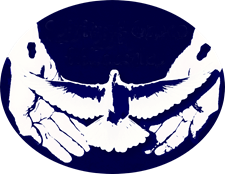 If you are blessed by the teachings, articles, devos, and missions emphasis of this ministry, please consider making a generous donation to Spirit of Grace Ministries. We are not a church; we do not receive offerings from members every Sunday. Nor would we dare ask offerings from the poor Africans to whom we minister in our overseas missions. We must depend upon tender-hearted American believers like you to help us carry on this work Christ has called us to do in feeding His sheep, equipping His servants, and proclaiming His gospel to the lost. Your donations are needed and greatly appreciated! A major part of Spirit of Grace Ministries is our ministry in the great continent of Africa. There is a tremendous harvest going on in the world these days, and we are privileged to be a part of it. Above is a brief music video featuring some video clips and pics from our recent mission in Sengerema, Tanzania.